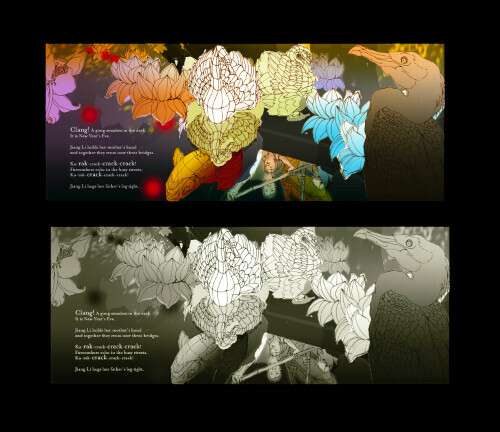 page spread – colour rough and greyscale (digital colour over rough sketch). Sometimes the line drawing gets confusing, so I find it’s necessary to drop some colour in there to see if the composition will still work. What program are you using to put the color in? Are you scanning them in? Do you need a special kind of scanner for the quality level to be just right, or does it matter? I’m using Photoshop to colour. Since these are just roughs for my own reference and experimentation, the quality doesn’t matter for this purpose; the scans are made with my own, old, flatbed scanner. When the illustrations are done, the publisher will send them out to be drum scanned.